The eighteen acres that surround the White House have been an unwitting witness to history—a backdrop for soldiers, suffragettes, protestors, and activists. Kings and queens have dined there; bills and treaties have been signed; and presidents have landed and retreated. The front and back yard for the first family, it is by extension the nation’s first garden. All the Presidents’ Gardens’ tells the untold history of the White House Grounds. 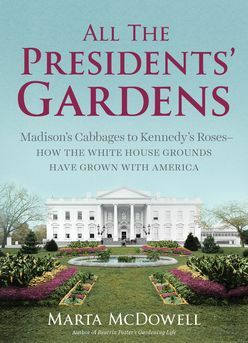 Starting with the seed-collecting, plant-obsessed George Washington and ending with Michelle Obama’s focus on edibles, this rich and compelling narrative reveals how the story of the garden is also the story of America. Readers learn about Lincoln’s goats, Ike’s putting green, Jackie’s iconic roses, Amy Carter's tree house, and much more. They also learn the plants whose favor has come and gone over the years and the gardeners who have been responsible for it all. Fully illustrated with new and historical photographs and art, refreshingly nonpartisan, and releasing just in time for election year, this is a must-read for anyone interested in the red, white, and green. The illustrated history of the White House grounds, starting with Washington and ending with Obama, from Marta McDowell, the bestselling author of Beatrix Potter's Gardening Life.